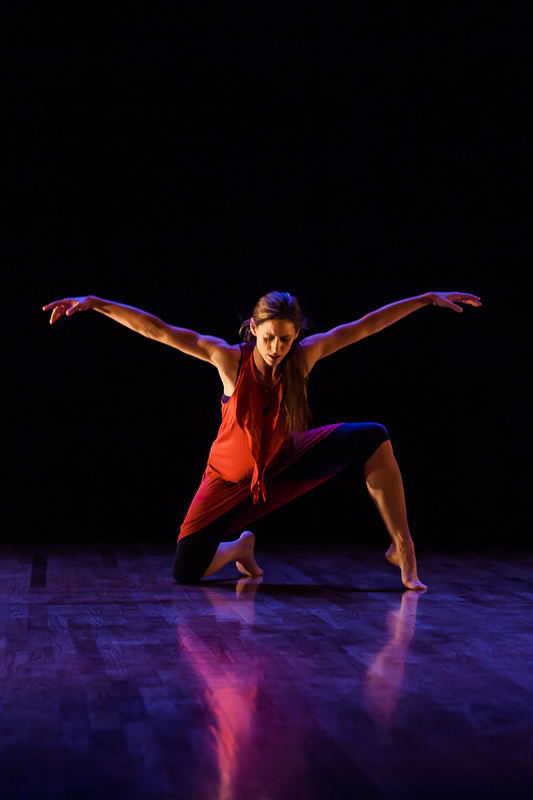 Inspired by historical events and contemporary culture, Mary Ann McGovern’s Sprawl gave the audience something to contemplate at Velocity Dance Center July 14, 2012. A combination of dance, music, spoken word, singing, and voiceover layered the stage in scenes of social injustice, industrial overgrowth, and the complex elements that have created the nation’s ever-growing cities and the sometimes tense relationships between the people who live in them. Sprawl is a single, linear piece, with untitled chapters segmented only by the absence of stage light. The show began with a rehearsal depicted on stage. 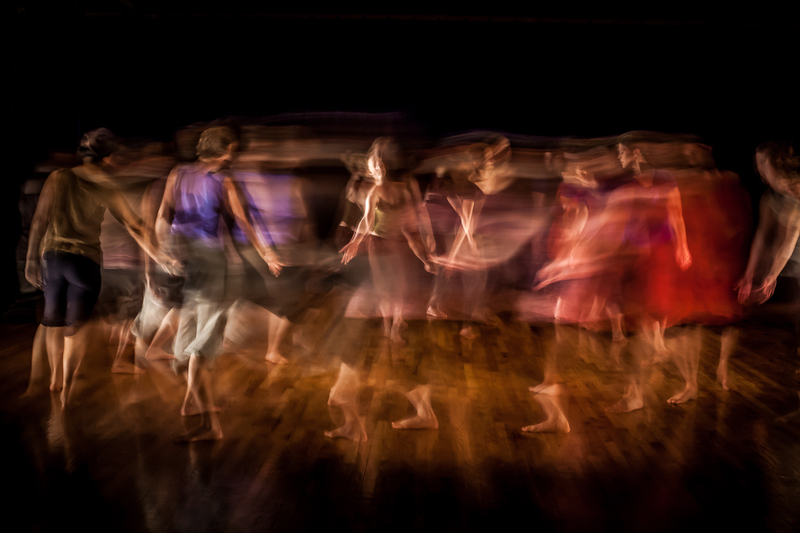 Two dancers moved in unison while a choreographer circled, directing them with an authoritative tone, urging them to use up the floor and commit to each movement. The dancing continued as the choreographer then addressed the audience, providing a prologue of scenes to come. The choreography that followed was quick, sharp movements alternating with an almost slow-motion grace, lit with subtle but effective lighting by Ilvs Strauss. Each dancer was dressed in soft-colored, light blouses or tanks with dark capris. Bare feet and ankles squeaked across the floor’s surface when dancers slid their bodies into wide Xs or stopped-short to catch another’s body as it landed a cartwheel or handstand. A voiceover from Crisis in Levittown, PA played while dancers portrayed the historic resistance of the all-white neighbors to the integration of non-white residents. A powerful and evocative dance follows, where four dancers, who have lined their bodies together in opposition to a single dancer, carry the one off stage in protest. When the lights return, we hear Dwight D. Eisenhower’s speech from Cadillac Square in Detroit, Michigan, in a self-congratulatory tone. Meanwhile, dancers fill the space in a chorus of industrial sound effects and movement depicting jackhammers and other tools of construction, pausing only to clap with smiles during the audio’s applause track. Zoe Keating’s melancholy cello played while, during brief black outs, more and more dancers poured onto the stage and the floor space continued to shrink. It was an effective representation of chronological, urban sprawl. Lines are drawn figuratively and physically in this performance. The cohesion of each scene overlapped the other, propelling the audience into the past while at the same time reflecting on the present. Partnering and lifts, counter balance and floor crawls, were executed with ease and precision. Sprawl’s choreographic lines and spacing, with this all female cast, was clean and exuded conviction. McGovern balanced quick, jolting movement with soft grace in each of her dancers. McGovern’s explorative approach is engaging. She exemplifies a documentarian style with her visitation to historic industrial growth, urban sprawl, and cultural disparity. It’s an approach filled with beautifully lined choreography, reflecting on past events that continue to challenge the nation in the present. Sprawl demonstrates her ability to provoke thought through dance. Watch for her upcoming works, as she is sure to make an impression on the Seattle dance scene. To learn more about Maryann McGovern and Dancers, visit www.maryannmcgovern.org.